Software Serial support has been added. 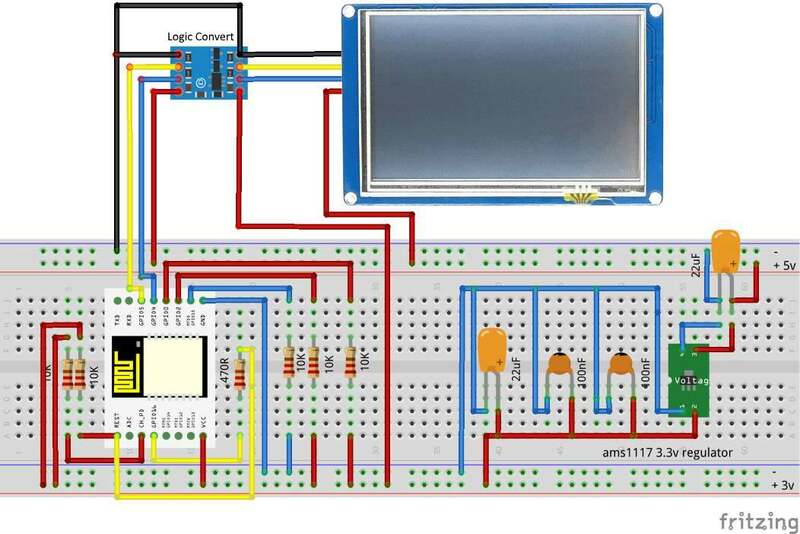 Now connect Nextion HMI display to any two pins of ESP8266. Check out our Github Repository for modified Nextion library for ESP8266 (Tutorial work is in progress). Nextion is a Seamless Human Machine Interface (HMI) solution that provides a control and visualization interface between a human and a process, machine, application or appliance. Nextion is mainly applied to IoT or consumer electronics field. It is the best solution to replace the traditional LCD and LED. Nextion includes hardware part (A series of TFT boards) and software part (Nextion editor). The Nextion TFT board uses only one serial port to communicate. It lets you avoid the hassle of wiring. Nextion editor has mass components such as button, text, progress bar, slider, instrument panel etc. to enrich your interface design. And the drag-and-drop function ensures that you spend less time in programming, which will reduce 99% of your development workloads. With the help of this Nextion editor, designing a GUI is a piece of cake. Nextion Editor is a Windows based drag and drop tool for creation Nextion GUI in real time, as you can see what you are building. Here is the fun begins, so let’s get started 😎 . Download Nextion Editor and install it. 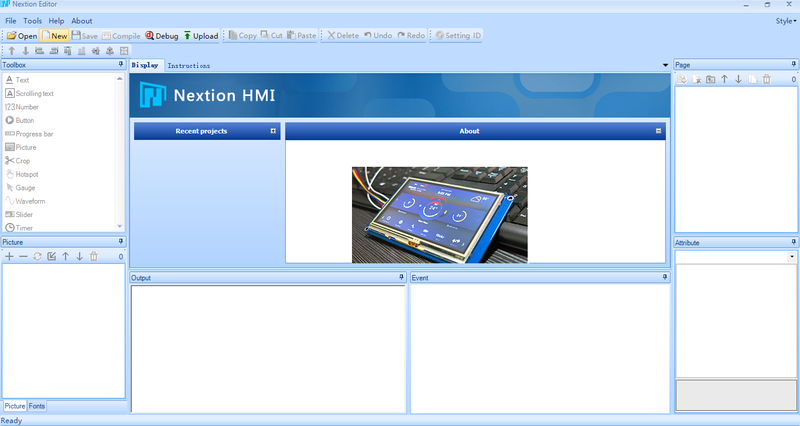 Download Nextion HMI file for current project and open it with Nextion Editor. Follow the video tutorial for rest of demonstration. Download Nextion Library and install it. Download .ino file from Nextion Example Sketch zip file. If you are using your own sketch, use the baud rate of 9600 in “void setup” function i.e. Serial.begin(9600); Follow the video for rest of the demonstration. 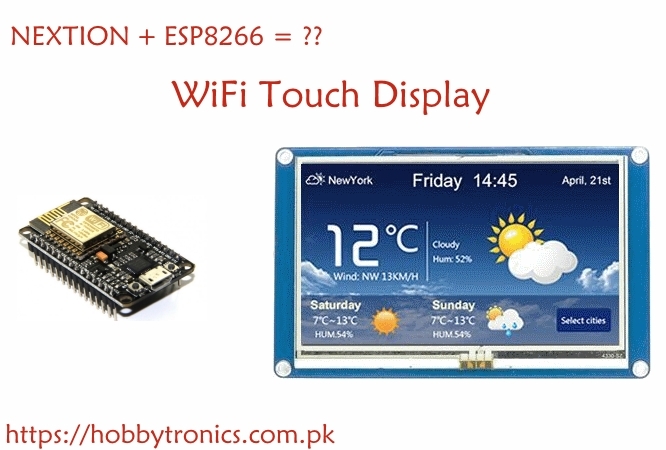 This entry was posted in ESP8266 and tagged Arduino, display, esp8266, guide, lcd, nextion, nodemcu, noobs. I believe the Nextion logic is 3.3V, the only 5V device is the backlight. AFAIK the logic converter is not necessary for connection to the ESP8266 which is also 3.3V. You are not receiving any debug information on your Serial Console because you have disable it . You have to instantiate the Serial library manually by issuing the following command in your Setup function. Javier, Links are working. However, I have updated the direct links in place of categorizing them under Downloads section. Moreover, We are going to update this tutorial very soon to simplify it’s each and every step. Stay tuned. That weather forecast is developed by someone else. We do not own it, so we do not have any hmi for it. There seems problem with software serial library. Which Nextion library are you using? Original one or modified by us? Hello Bob, We are pleased to know that our mod was helpful for you. Actually Nextion Library (modified by us) has not been updated for quite a while and any new features added to original Nextion Library may not been added yet. I cannot provide you with exact timeline for all these new features addition in our modified library but it will be covered soon. how do I define in which pin Rx and Tx will my nodemcu communicate with the nextion display? A query , you have put a link for Nextion library here, but there is another linked termed as Nextion-master ; which of these would work with nodemcu 1.0 . Also can we connect the tx , rx of nextion with rx,tx of nodemcu which is gpio3 and gpio1 as compared to yours as you are using a software serial. can i connection without level shifter to gpio3 and gpio1 if using hardware serial. can i connection without level shifter to gpio5 and gpio4 if using software serial. I have corrected the link for downloading library. Library at our github repository is the new one in which we have added support for software serial. It is a modified version of original Itead Studio Library with ESP8266 support included in it. Nextion displays are of 5v logic and ESP8266 or Nodemcu (A development board of ESP8266) pins have 3.3v logic. RX and TX pins are not tolerant to 5v. However, all other pins have tolerance to 5v up to some extent. A logic shifter is compulsory otherwise, your ESP8266 will be destroyed after sometime. The Nextion output level is 3.3v? OK, so that means a level shifter is completely unnecessary and should be deleted from the diagram above. nice tutorial from you. everything completed. if you dont mind, can u share the node flows code? Really interested to know so that i can simulate all those thing as a completed tutorial/example. Waleikum Salam. Thank you so much for appreciating us. We are using our ESPMetRED Library for communicating Node Red and ESP8266. There are simple MQTT IN and MQTT OUT Nodes involve in this whole back and forth communication. Being an old article, We cannot assure you providing the Nodered flow, however, We’ll try our best to provide a more clean tutorial in our blog as soon as possible. Just stay tuned. Hi Ahmed , would you be interested in writing code for this display plus gui ? could you share node-red flow codes? Could you write code for nextion display enhanced and arduino controller for me? I would help to adapt it to my use. Please find Nextion Example Sketch under Software Needed section. Or visit this link.